Rent a Tinkerbell bounce house and your child will believe in magic. A fun bounce house coupled with everyone’s favorite fairy makes for the perfect kids birthday party add-on. Clowns.com has Tinkerbell bounce house rentals in New York in neighborhoods including Brooklyn, Bronx, Queens, Manhattan, Westchester, Staten Island, and Long Island. Peter Pan’s favorite fairy will sprinkle pixie dust all over your magical event. Clowns.com also offers fairy theme parties. A fairy performer will meet and greet children, lead them in songs and activities, paint their faces, blow balloons for them, and serve everyone cotton candy. There is even the option to upgrade to a Tinkerbell performer who will match perfectly with this beautiful bounce house. 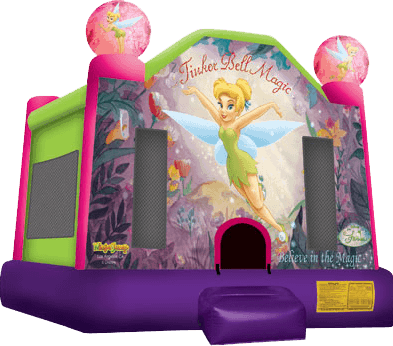 The Tinkerbell bounce house displays beautiful artwork of Tinkerbell in her magical fairyland. Colorful flowers fill the landscape of her magical land. Slip into the bounce house under her wand and let the party begin. 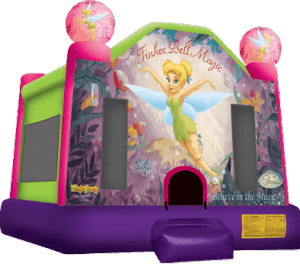 The Tinkerbell inflatable bounce house is made of lite n strong™ vinyl which is durable, portable, and fire-resistant. It features 360-degree mesh windows so children can be closely supervised while they bounce and play. 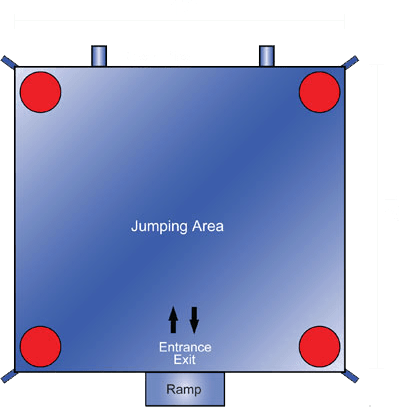 Let your child and their friends play in this fun and safe moonwalk for hours. Let Tinkerbell sprinkle pixie dust all over your child’s special day.